A beautifully roasted turkey (or roast turkey) is a classic centerpiece of many holiday menus. 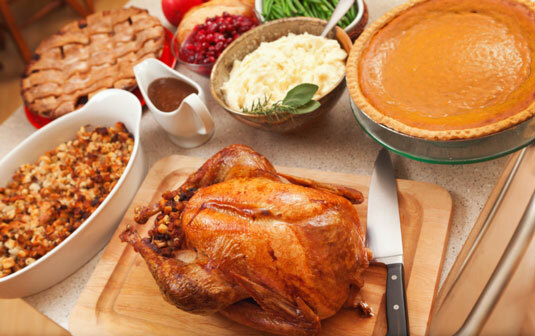 Deciding what to make for the main course of your holiday meal can be overwhelming, so why not stick with the basics? Cut off and discard the wing tips of the turkey. Remove the neck and giblets packet. Rinse the turkey cavity well and pat it dry. Stuff the cavity of the turkey with the onion pieces, garlic, carrot, and salt and pepper. Sprinkle the outside of the turkey with salt and pepper and rub the turkey all over with 2 tablespoons of the oil. Rub the bottom of a large roasting pan with the remaining 1 tablespoon of oil. Place the turkey on its side in the roasting pan. Place it in the oven and roast for about 40 minutes. Turn the turkey onto its opposite side. Return it to the oven and roast for another 45 minutes, basting often. When a meat thermometer in the thigh registers 180 degrees F, remove the turkey and set it aside briefly. Pour off and discard the fat from the pan. Return the turkey to the pan, breast-side up, and return it to the oven. Pour 2 cups of the broth around the turkey. Roast for about 30 minutes, turning the pan laterally so that the turkey cooks evenly. Continue baking, basting occasionally, for about 1 hour and 15 minutes. Remove the turkey from the pan and cover the turkey loosely with aluminum foil. To make a sauce, scoop out the vegetables from the cavity of the turkey and place in a large saucepan. Add the liquid from the roasting pan. Add the remaining 1 cup of broth and the chopped onions, bring to a boil, and then remove from the heat. Strain the sauce and season it well. Carve the turkey into serving pieces. Check the label on your turkey for approximate cooking times and temperatures. Remove the turkey from the oven when its internal temperature is 5 to 10 degrees less than the final internal temperature, and then let it rest for 15 to 20 minutes. During the resting time, the turkey cooks 5 to 10 degrees more. None of this is exact science, though; you have to use a meat thermometer to get the results you like. When inserting a meat thermometer in a roast, do not let the metal tip touch the bone — the bone is hotter than the meat and registers a falsely higher temperature. If you’re a vegetarian or you’ll be entertaining one at your holiday party, be sure to prepare something special as a main course or an alternative to your meat dish. Expecting vegetarians to make do by just eating salad and side dishes doesn’t do much to help them enjoy the meal.